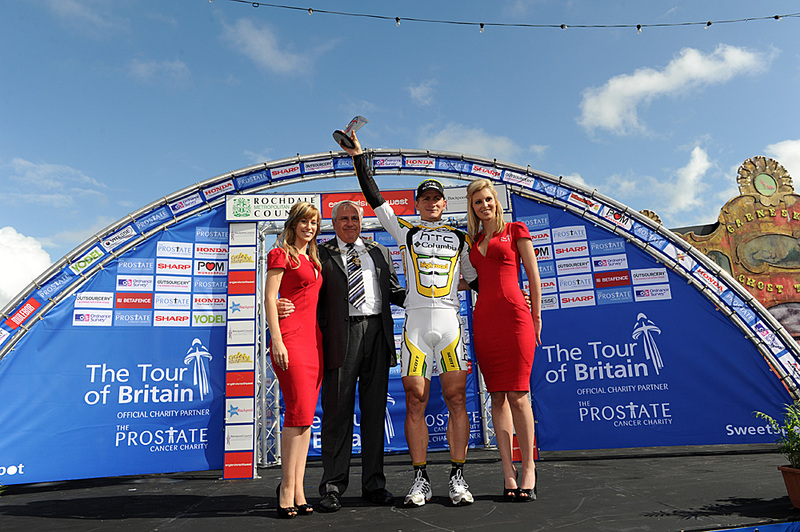 Already the most prolific rider in the peloton this year, Andre Greipel won the 132.6km opening stage of the 2010 Tour of Britain to add another victory to his tally. 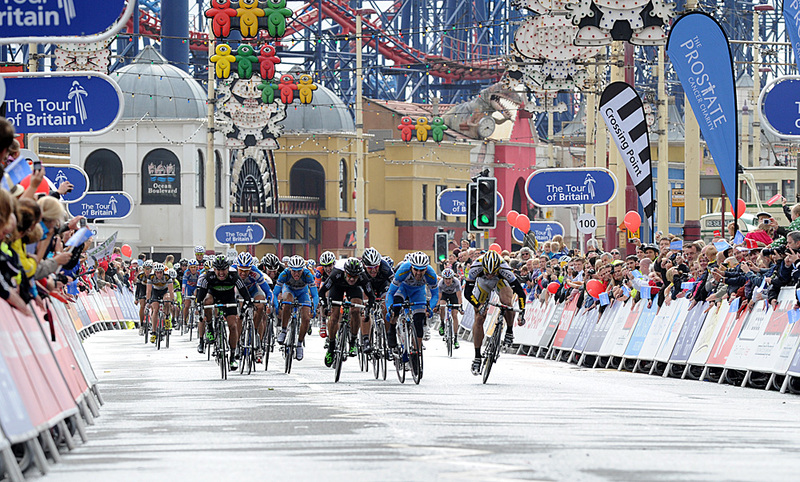 The HTC-Columbia sprinter outgunned Manuel Belletti (CSF-Colnago) and Team Sky rider Greg Henderson at the sunny seaside finish in Blackpool. “I’m happy to win the first stage. It was our main goal to win today, and we did it,” the German said after the finish. The day had started under a cloud in rain-drenched Rochdale. Before a deluge of early attacks, Andre Greipel took the race’s first intemediate sprint in Norden and with it, the precious bonus seconds on offer. The day’s breakaway was formed on the first King of the Mountains climb of Deerplay Moor at the 25km mark, consisting of Giro d’Italia maglia rosa wearer Richie Porte (Saxo Bank), Jack Bauer (Endura Racing) and Wout Poels (Vacansoleil). After reaching a maximum lead of six minutes, Team Sky and HTC-Columbia spearheaded the chase to peg back the trio’s lead as the race turned south-west through Lancashire – and very changeable weather – towards Blackpool. Meanwhile, on the comeback trail after his life-threatening crash last September, Saxo Bank rider Jonny Bellis abandoned the race at the 54-mile mark. In front, Dutchman Poels made the King of the Mountains jersey his, while Porte took the sprint competition lead. Bauer was spat out of the breakaway with 55 kilometres to go, as the pressure and speed increased behind. 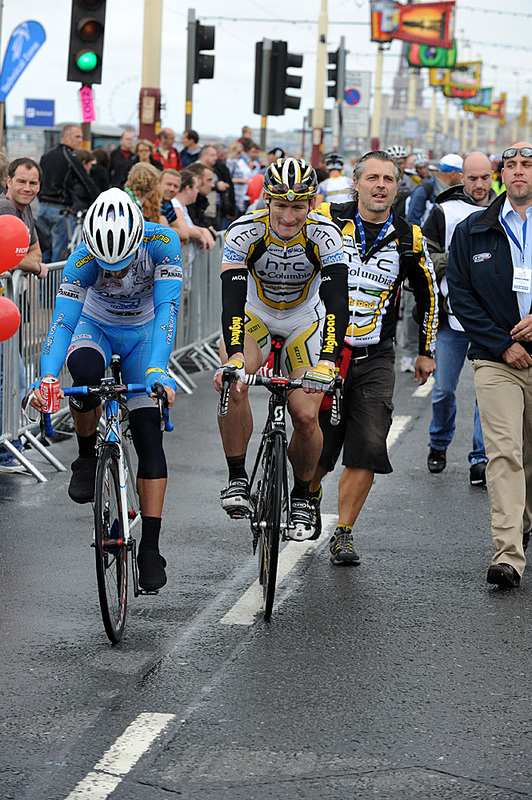 Down to two, the break was nullified on the run-in to the popular seaside resort, setting up a fast sprint finish. While many people’s favourite for victory, Andre Greipel’s hopes were almost scuppered by a puncture with 8 kilometres to go. “We came back with four to go; I thought ‘it’s finished’, but we had luck on our side,” he said. As a late attack by ISD rider Carlo Scognamiglio was snuffed out, it was business as usual for the German at the finish. Team Sky tried to set it up for Henderson, but the Greipel went like the proverbial Blackpool trams, that run down the promenade, to record his 19th win of the year, ahead of Giro d’Italia stage winner Belletti. With some tough stages to come, starting with a grippy route around Stoke tomorrow, Greipel was unsure about his chances of keeping the yellow jersey to the conclusion of the race next Saturday. “I don’t know the climbs, I just look day by day. It’s hard to control the race with six guys; riding on the front with them is tough too,” Greipel said. With bonus seconds in hand from his audacious breakaway bid, Porte moved into the top five overall. second and third in intermediate sprints to put himself in a promising early position.